Let me say, that a year later, my babylands are still my favorite diapers. If you are still interested in more, definitely check out alvababy.com. They are highly rated and only $6 a diaper. I also got some good deals on used bumgenius diapers off cottonbabies.com, but you have to catch them at just the right time and they go fast. The inserts that come with the ebay diapers are great for newborn, but once you hit the 2-3 month old range, they aren’t great, and you’ll need a bit more oomph. I bought a bunch of used bumgenius inserts off cottonbabies when they had them, but I also called a cloth diaper service that didn’t deliver here, and asked if they sold their old ones. I got a dozen infant prefolds, all prepped and ready to go, for $8. They work great as inserts. I also bought a few dozen rag quality diapers for $3 a dozen, and these work well for inserts as well. I have noticed that cloth diapering in the beginning definitely did up our water bill. We have a front loader washing machine and use less water, but it did raise ours about $10 a month in the beginning. It’s less now since my stash has increased and I don’t have to wash them as often. Now it’s just a couple of bucks more than it was prior to cloth diapering. If your homemade detergent (I make my own as well) doesn’t seem to do the job after a while on the cloth diapers (it does happen), the best change you can make is to switch to Tide. It’s like the “dirty secret” of cloth diapering moms. I was using it in the beginning and then read how I had to use cd friendly detergent. I wasted so much money trying all the different types and none worked with our hard water. I went back to Tide, and found out that a lot of moms had done the same thing. You can use any kind except for the stuff that has the downy in it. I have a box, and I use an oxyclean sized scoop for a load of diapers and the box will last the entire time we cloth diaper. I’ve been using the same box for a year and have barely used a quarter of it. We don’t cloth diaper at night though. I’ve tried all sorts of stuff aside from wool, and none of it has been successful. We were able to do it when she was a newborn though. We also use disposables when we got out. She’s been leaking the last few days and I thought it was the way the diapers fit. Maybe I need to get some other type of insert. Thanks for all of the great ideas!! I once read of infant potty training and know I want to give it a try, but my fall back plan is cloth diapers. Thanks 🙂 Good luck with the potty training! So, so happy to see someone else using cloth! I have used thence for five months now. I use prefold with flip and thirsties duo covers. I like them sooo much, but he is about to outgrow his thirsties size 1’s so Im lookin around to see what else I might find. Aio’s just aren’t in the budget for us! Also awesome you make your own soap! I do top:) stop by my blog sometime I posted about cloth diapers as well! How much do you pay for a cover? Do you have any trouble with over-night diapering? I have grovia covers but I just trifold my prefolds and lay it in the covers and put it on. Even my husband can do it. As long as my daughter doesn’t poop we can use one grovia cover all day. I do this with Flip covers too. No need to use only that brands inserts. This should save you on some laundry, and money. I only use my pocket diapers for when we are out, because they fold up nicer in the diaper bag, or at night. I did this tonight after seeing your comment! I will try doing this more when we are at home – I have plenty of prefolds to get us through the day! I highly, highly recommend Mother-Ease one-size diapers. My son wore them from 4 to 28 months. Then I sold them to a friend who used them on her baby, who’s now toilet trained. She says not one of the diapers has worn out! They are strong and absorbent yet soft, even if you line-dry. They’re easy for parents to snap but hard for baby to take off. We tried a bunch of covers, and by far the best were Dappi pull-on nylon pants which are like old-fashioned rubber pants but made from softer, thinner fabric. The leg elastic is gentle on baby’s skin but holds stuff in really well! We never had a “blow-out”. Never. You have to buy a new size of these covers every 6 months or so, but they are so cheap (2 for $5 or $6) that it’s not a big deal. They’re easy to wash and dry quickly, so having 4 of each size is enough. We got the Dappi covers (except we got vinyl instead of nylon, slightly cheaper) and they are working well. They really do hold stuff really well! Congrats on the cloth! I ❤ my CD and we used them exclusively since about day3 of having baby. We use mostly prefolds during the day and pockets at night. My best advice for ebf poo is a prefolds and Thristies cover combo. The double gussets work like a charm! If you're looking for cheap diapers, you MUST check out diaper swappers.com I bought all mine there, mostly secondhand and even the major brands you can find at bargain prices and even free sometimes! (they also let mamas run lottos, so you could win freebies too!). Thanks for linking up with us today for the mommy brain mixer! I have been checking diaperswappers and always seems to miss the really really really good deals!! I was looking at your picture thinking that I have the same ones! I used eBay ones for about a year and loved them. They did/do fit better now she’s a toddler though. I did get some better ones which can be used as pull ups, they are called ezy peezies and I love them. They are the same as the eBay ones (made in the same factory actually) but better quality. The bamboo is more absorbent than the microfiber and I love the pull ups. We can do standing up changes, but if it’s a messy poo then it just comes off like a normal nappy. I also got given some baby beehinds this week that I sent to daycare today but I’m yet to try myself. I usually send the eBay ones to daycare and have the ezy peezies on the days when she’s with me since daycare prefer the eBay ones . Oh, how I wish our daycare would use cloth diapers!! It’s amazing how far cloth diapering has come!! So glad that you have had a good experience with the baby city diapers. I have never paid more than $2 for the ones that I ordered 🙂 Although it has been on nights I couldn’t sleep at about 2 am! 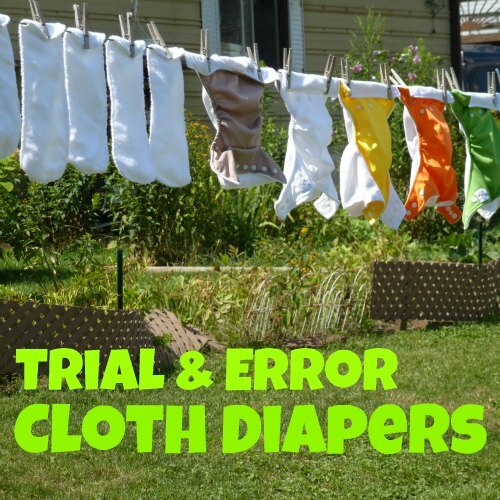 This is our first time cloth diapering, and it was one way we decided we could afford me to stay home with our kiddos. I have spent less than $50 total, and have 28 diapers! I am so excited for my guy to get here so I can use them, although I have a bunch of newborn prefolds and several covers and snappis that were given to us, so I will probably use those for the first month or so!